The locals told me that U Kucharzy in Warsaw is the most traditional of Polish restaurants, and it’s easy to see why from the heaviness of the mains that we ate. 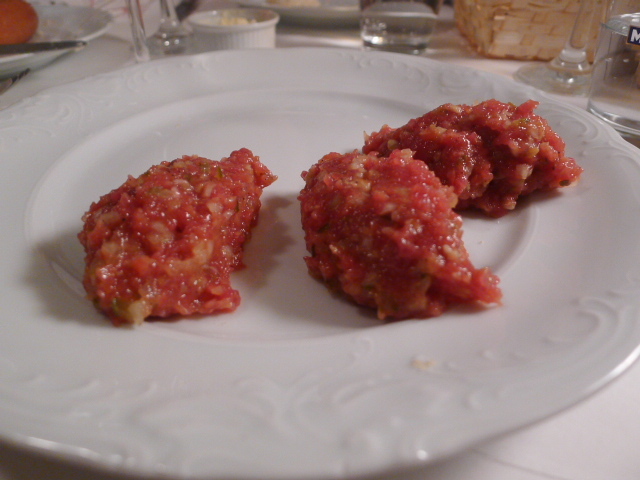 But other than for a taste of Poland, the best reason to go to U Kucharzy would surely be for their renowned steak tartare (38 Polish Zloty (zl) – about £8.80). This tartare was sublime, and perhaps the best that I have ever had. What lends greatness to this starter is the way in which a slab of raw beef fillet is chopped and chopped, over and over again, by a skilful chef at your dining table. The result of this effort is to add a touch of theatrical drama to the dish as well as gracing the meat with a texture so fine, it simply melts into a soft silkiness on your tongue. In the mix were also some capers, anchovies, cucumber, olive oil, raw egg yolk and onions. The seasoning was deftly done, and the onions gave the tartare a little kick. 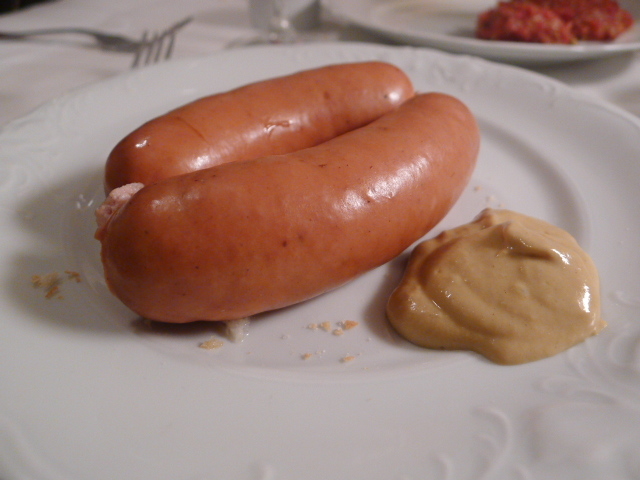 The Poles are also known to enjoy their cured meats and sausages, and our second starter of veal sausages (38zl – about £6.50) was a testament to this. This dish proved to be substantial with two fat pieces, and was tasty in a processed-meat kind of way. There was more theatrical showmanship as each of the mains were plated at the table. A stream of waiters converged at our sides as first the meat, and then the veg, were placed on our plates as if a drama was unfolding act by act. The half roasted duck (68zl – about £15.60) packed a calorific punch as it was also finished with a drizzling of melted duck fat. To me, duck seems best served pink, and this Eastern European way of cooking the meat well done left the breast a little dry, although the duck leg remained moist and flavoursome. The sides of mashed potatoes were incredibly salty and unpleasant, but the braised red cabbage was sweet and tasty, and the cranberry sauce worked well with the duck. A roast pork spare ribs (and oh what a big rib it was) did not fall of the bone as promised by our waiter (58zl – about £13.30). But it was by no means tough, and it filled the belly fairly nicely. But it was missing a certain spark as it lacked the intensity of flavour which would have prevailed had the meat been browned before cooking. 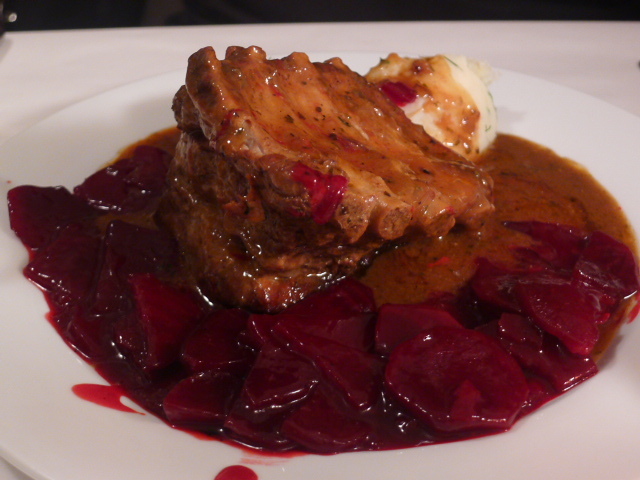 A side of stewed beetroot was tender and delicious, but a little too sweet to eat too much of. A large portion of pork stewed with onions and garlic (58zl – about £11) disappointed for both the overcooked dry meat and the lack of garlic flavour. At the base of the dish was a piece of bułka, a typical Polish bread, which was not only covered by the pork, but a topping of onions spiced with cinnamon. The onions were nicely done, but overall this dish proved difficult to eat for the dryness of the pork grated harshly on the palate. 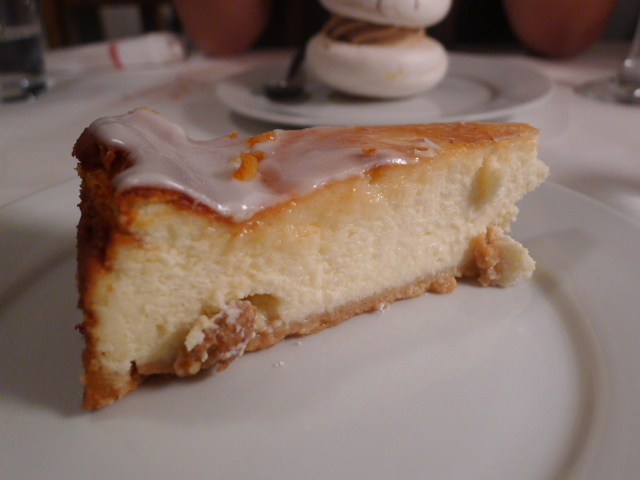 We also tried a traditional Polish cheesecake which was light and airy, and a coffee meringue with coffee cream (both 18zl – about £4.10). 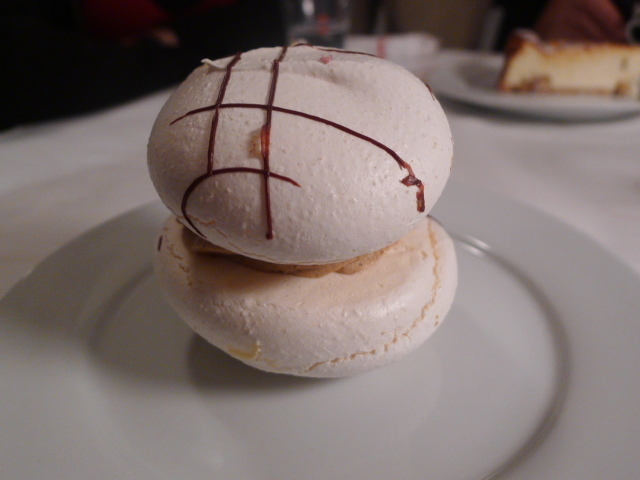 The latter was well made with a gooey centre but was far sweeter. The service was well orchestrated, especially when it came to the plating of the mains. But it was a bit perfunctory, and we could have done with a bit more attention at times. U Kucharzy offers up a certain dated charm which is quite seductive on the tourist eye. To this end, it’s unsurprising that most of the voices you hear belong to the Americans, French, etc, rather than to the Poles. The restaurant was once the kitchen of the now defunct Hotel Europejski, and little seems to have been done to modernise it. Some of the awkward spaces have remained, as have the white tiles, leaving it with the look of a refined soup kitchen. That said, when you throw in the pianist belting out classic melodies of a by-gone era, its hard not to enjoy the ambiance of the restaurant. I have no doubt that U Kucharzy embodies authentic good old Polish cooking and it was enjoyable enough. But truth be told, this wasn’t my kind of food. It was too rich and too heavy, and my heart did not thank me for it. The portions were also large, and one main could have easily fed two average eaters. I appreciated it for the enlightenment it brings to the Warsaw visitor who wants to try hearty, traditional Polish cooking at least once, and for this reason it’s worth a trip. But their steak tartare is to-die-for and a dish I would eat over and over again. 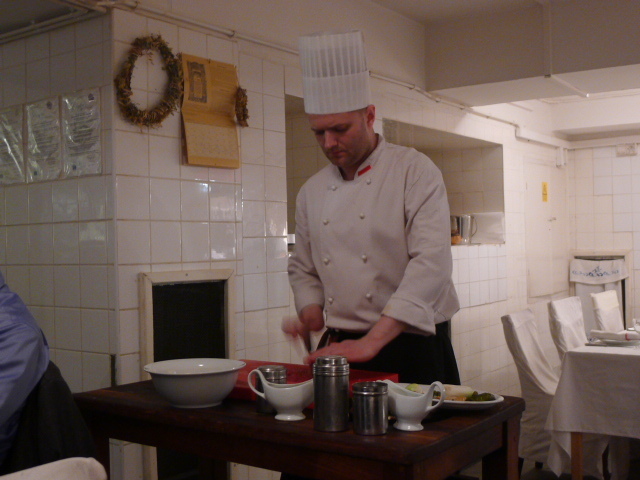 To check out U Kucharzy’s sister restaurant in London, Gessler at Daquise, click here. Price range: About £30 for three courses. Excludes drinks and service. Similar to your views actually. There are more interesting places in Warsaw I bet. I’m heading to Warsaw the week after next and this was on my list…but maybe not anymore? Are you going to do some more posts?? I need more recs! Yep knew it was a chain. Good to hear that you have similar views on the London restaurant so I probably wont go to it. No it wasn’t my kind of food, but my goodness, that steak tartare was divine. I wasn’t in Warsaw that long so I don’t really have any other recommendations. I think you should still go to U Kucharzy though to try their steak tartare. After reading Katrina’s comment, I thought I’d give the London Gessler a go, and man, what a disappointment, in spite of some of the good comments you see on Timeout, etc. Tried the tasting menu, with the three starters being extremely tasty. But it was totally offset by over an hour wait between the second and third started, then additional 30 minute waits between starters, soup and the main, with each subsequent course getting progressively worse. In the end, I think we were there over three and a half hours. Which was a real shame, the place had some fun charm to it. Disappointing. What a shame to hear that it was so disappointing. I must admit that U Kucharzy was fun to try in Warsaw but I wasn’t inspired to try the one in England after my experience there. I have eaten at the White Restaurant (u-kucharzy) 6 times now. 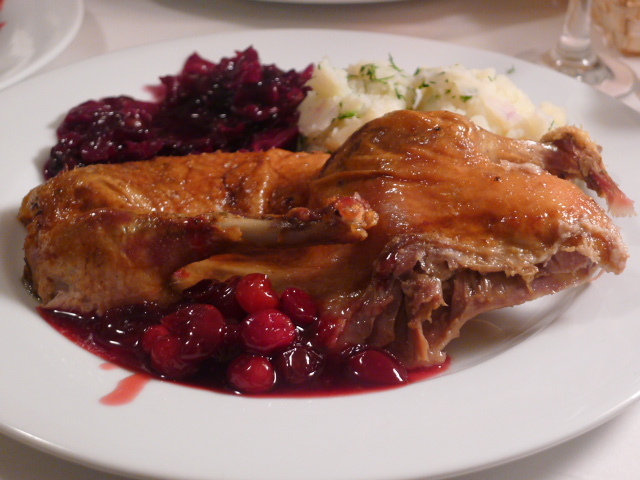 It is my favorite Warsaw restaurant and the duck is my favorite dinner. The skin is basted sweet and crispy while the meat is tender and moist, baked to perfection. I enjoyed this meal so much that when I was in London I had to have it once again at the sister Gessler Daquise. The Steak Tartare is second to none. I give this Restaurant 5 stars. I have not had a bad meal in the 6 Warsaw and 2 London visits. I am deffinately a fan and will return when ever I am in Warsaw or London. Glad you like U Kucharzy. I think the steak tartare is one of the best I have ever eaten. Nice post. Thanks for sharing your information.